When planning your bug out location and situation, you need to consider a number of different factors. Among those factors is climate, and we’re not just referring to hot or cold weather, though that is vital to consider (you don’t want to freeze, after all). “Watch for flooding.” This is pretty straight forward. Besides the issue of flooding washing your seeds and seedlings away so that they can’t take root where you planted them (and can, therefore, harvest them), Duever notes that areas with standing water can cause root rot. The answer? Don’t plant where flooding is common or likely, or you’ll need to find efficient ways to drain water so that you don’t have flooding and standing water issues. “Examine plants.” Look over your plants after storms for signs of disease or damage that can’t be handled easily (such as a broken stem). Basically, know the state of your fields to paraphrase a Biblical phrase. 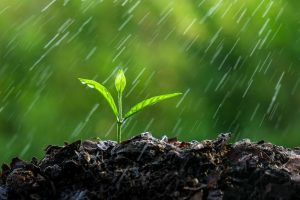 “Replenish nutrients.” Plants need certain nutrients to grow healthy and strong in the same way that people do, but these nutrients can be washed away in wet weather. Make sure that your plants are getting what they need. “Don’t forget weeds, water, and slugs.” Some weeds and slugs like wet conditions, and these weeds and slugs can damage plants in your garden. The water part? Standing water. It’s a breeding ground for mosquitoes. Get rid of it. “Make the most of it.” It’s just a healthy psychological viewpoint to do what you can do and accept what you can’t change. If you’re in a rainy season, instead of getting frustrated and griping about it (and getting stressed out about it), just accept it and make the best of the situation. Your body will thank you for your lower stress levels (as will your spouse and family), and, by relaxing in this, you may find that you focus more on the good side of this situation (and there is always an upside). So, there you have it, gardening tips for if you are having to deal with a rainy season. But, keep in mind, many areas with a rainy season also have a drought (dry) season. Be sure to prepare for that, too.